I’ve been researching and writing personal finance articles for almost 8 years now. One thing has stayed the same, and that’s the mentality that debt is normal, or even beneficial. 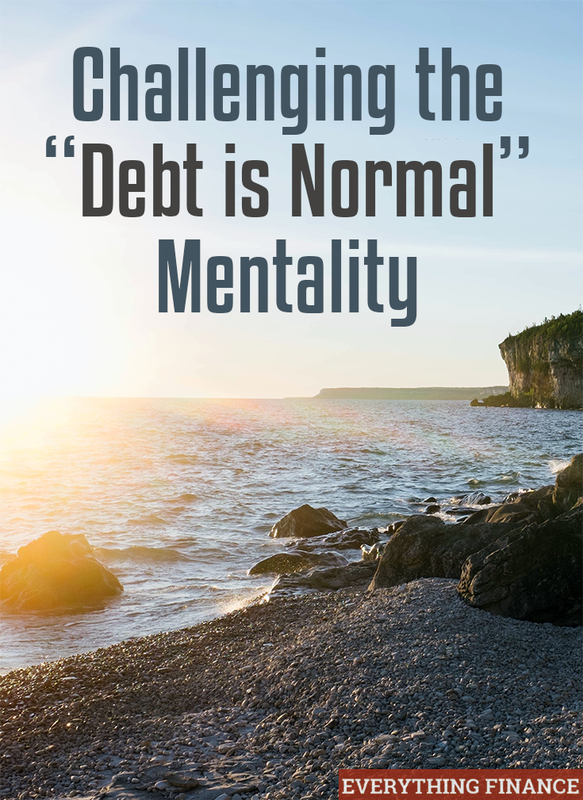 I want to challenge the “debt is normal” mentality. Yes, debt is common and popular, but it shouldn’t ever be considered normal. Here’s why. What Would You Do If You Had No Debt? Just imagine for a second that you have no debt. You own your home clear and free, your cars are paid off, and you aren’t reminded about how costly your degree choice or furniture purchase is every month. What would you do with all that money now leftover? Even individuals who don’t earn a huge income each year could see an extra $500-$1,000 of freed up money each month if they were completely debt-free. We are so used to paying bills that I think most of us just see our debts as another bill. We put our auto loan payment on the same level as our grocery bill. We count them both a necessity to survival. It seems as if every time I talk to someone about my desire to be completely debt-free, I’m met with the words, “But some debt is good”, or advice like, “You need some debt, so don’t pay off everything”. Even CNN Money says, “Of course, avoiding debt at any cost is not smart either if it means depleting your cash reserves for emergencies.” That’s just asinine thinking. If you don’t have any debt obligations, then you should have been saving and investing your money. It’s much easier to pad your emergency fund and savings account when you don’t have huge mandatory debts to pay each month. If you think always having a mortgage for the tax break saves you money in the end, it would be best to do more research and number crunching. Of course, it’s wise to take the tax break when you do have the mortgage, but to avoid paying off your home early just so you can get the tax break is ridiculous. The money you save through a tax break pales in comparison by how much money you could save if you didn’t have to pay monthly mortgage payments and interest rates. Also, it’s much easier to donate a large chunk of money each year to get that same tax break. Finally, I’m usually hit with people who talk about debt and creditworthiness as if they are the same thing. You don’t need to rack up thousands of dollars of debt to boost your credit. What Could You Accomplish Without Debt? I really hate my job, but I can’t quit because student loan debt is outrageous. I wish I could travel this summer, but there is just not enough money in my budget because of debts. I wish I could quit my job and pursue my passion of writing, but there are too many bills to pay. I won’t be able to retire this year because I don’t have enough money saved. Debt traps us and zaps us of financial freedom. Before you accept that your debt is normal or good, I challenge you to imagine how much better life could be if you were not attached to debts. Do you think debt is normal, or that it’s good? Do you buy into the myth you need to have debt or carry a balance to establish credit? I don’t practice that mentality of “debt is normal”. As much as possible, I stay away from debt and it does feel good being debt free. It is like you have more freedom and less or even no stress to deal with.